Two weeks ago I traveled to the United Nations Church Center in New York, NY for the Unitarian Universalist-United Nations Office (UU-UNO) Spring Seminar 2010, Thursday April 8 – Saturday, April 10. About two months prior I met with one of the UU-UNO Board members, Connie Baker, to talk about the the Green Sanctuary Program. 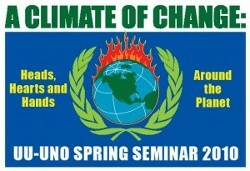 Connie told me that their upcoming Spring Seminar was going to be about climate change and asked if I would be willing to attend. I said “sure.” The next week, I received an email follow-up requesting that I also speak on a panel to which I also agreed. The theme of the seminar was “A Climate of Change: Heads, Hearts, and Hands Around the Planet.” As the Program Manager for the Green Sanctuary Program at the Unitarian Universalist Association of Congregations (UUA) I am expected to be one of “the” voices for the UUA on the environment and environmental justice. I was slotted to be on the Friday after-lunch “Hearts” panel “Faith-Based Perspectives on Climate Change.” I left for New York with a handful of notes for my time to talk on the panel. Thursday when I arrived at the Seminar, I was suprised and pleased to find that the majority of participants were youth and young adults – not your typical UU crowd. After the ingathering and key note speaker we did some Creative Programming where each group was given a “consequence” of climate change to prepare a skit to explain the “consequence” to the larger group. The skits were excellent, the youth had fun and were engaged and the adults were enjoying working with the youth. This got me thinking about what I was going to say on my panel on Friday so I left at lunch for the hotel for re-imagining. The afternoon for everyone else consisted of a panel on the “Techincal Aspects of Climate Change” (“Head”), a viewing and disucssion of Rising Waters, and a concert by Amy Carol Webb. Friday morning Amy Carol Webb led the ingathering – I was excited to hear her play because I didn’t see her the night before. Needless to say, I felt inspired by her music. Then there was the “Hands” panel “Climate Change Action, Global & Local” followed by a Guided Meditation and UN Tours/lunch. My colleague, Rev. Eric Cherry, UUA Director of International Resources, was the moderator for my panel. Erin Lothes Biviano, Theolgian and Research Fellow at the Earth Institute of Columbia, spoke first about various faith communities motivations, interests, and advocacy work on environmental issues. She was followed by Reena Kondo, Co-Chair of the Green Sanctuary Committee at her congregation, Community Church of New York, and Regional Representative for the Green Sanctuary Program when it was managed by the UU Ministry for Earth (UUMFE). Reena spoke about her personal journey as an environmentalist through the Green Sanctuary Program. During my re-imagining the night before I decided to make my talk interactive. But before I got up to speak, Eric noticed that people were falling into a post-lunch coma and got everyone up to stretch and move around. I was ready to play off the energy the group was expending. “The word stewardship has been used multiple times throughout this seminar. I want to share with you, my definition of stewardship. Stewardship is the growing, nurturing, promoting, and building of congregants’ gifts, call, and spiritual vocation. Stewardship is the spirit that influences the things that people do for their faith community. Congregations inspire, educate, advocate, and celebrate. In our best moments, congregations provide a place in which we care for and help one another as well as other creatures and ecosystems that support life. People of faith around the world are coming to understand that thrreats to the environmental are threats to the principles of justice and compassion at the core of every religion. And environmental stewardship is getting people tosee this work as a religious activity – a practice of love. When we are truly environmental stewards, we are practicing what we preach and seeing all the implications and applications of our theology. I then asked for someone in the audience to name off the 1st Principle. Someone quickly identified “The inherent worth and dignity of every person” and then I asked for someone to share with me how the 1st Principle related to environmentalism and environmental stewardship. Some shared an example, not one I would have thought of but one that made sense. As a group, we then went through the other 5 Principles and examples. Along the way, I jokingly told the audience that they all needed to go back to UU 101 because at times we were having a hard time identifying the principles (or at least speaking up). We talked about the 5th Principle before the 4th which didn’t really matter. When we got to the 6th Principle: The goal of world community with peace, liberty, and justice for all, the group was struggling with coming up with an example. So I reminded them of the skits we had done the previous day. One of the “consequences” one group got was “limited resources” and they did a skit that was a news report that talked featured groups fighting over water sources, fighting over drilling for oil, etc. After giving that group a round of applause for their skit, people were able to identify that if we weren’t good stewards of our environment that there would be wars and we wouldn’t and couldn’t have a world community with peace, liberty, and justice for all. “So now we know why, we, as UUs, are called by our faith to be environmental stewards. Lets talk a bit about environmental justice. A definition, collaboratively developed by the UUA’s Green Sanctuary Program, UUA’s Office of Advocacy and Witness, UUMFE, and the UU Service Committee (UUSC), of enviornmental justice is the human affirmation of our place within the interdependent web of all existence. Environmental justice pursues simultaneously the protection of natural systems and the ecological health of human communities, while building relationships to create a large impact. We recognize that throughout the world, poor and working people, and especially people of color and indigenious people, are pollution’s first victims. They are the least equipped to mitigate the impacts of global warming, and will be the first to join the masses of environmental refugees. At the UUA’s General Assembly 2010 in Minneappolis there is a business resolution called “The Green Revolution in Religion”. It calls for the Association to report on “progress in promoting environmental stewardship and environmental justice, with recommendations for action in the twenty-first century” as well as encourages all UU “congregations to support the Green Sanctuary Program and to apply for Green Sanctuary accreditation.” I challenge you to go back to your congregations and to discuss this resolution. Unfortunately, I wasn’t able to stay for the rest of the conference. However, I was delighted to get an email that shared the Spring Seminar Statement 2010 written at the Seminar. I encourage you to share it with your congregation and community.